"She's dead. Wrapped in plastic." Okay, Twin Peaks, David Lynch's bizarre murder mystery series, is television's finest moment (at least when it comes to drama). Of that I am firmly convinced. When I started taping the program with the pilot on Easter 1990, I knew instantly that this was truly something very special. Now I can start discarding those tapes, though, because the series is finally making its debut on DVD. 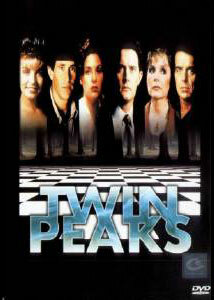 Unfortunately, David Lynch needed to raise money for production, and sold the home video rights for the pilot to Warner. That company has proceeded to sit on the rights (as it has done with 99.9% of its massive catalog) and refused to release it onto home video. Luckily, the overseas rights are not held by Warner, and a disc of the pilot episode was released by Catalyst Logic in Hong Kong. Although Hong Kong is notorious as a home of bootlegging operations, this disc is believed to be an authentic, licensed release. It can be acquired from a number of online importers, and is regularly offered for sale on eBay, though often at exorbitant prices. But the Twin Peaks experience isn't complete without the first episode, which sets up the situation and the complex character relationships. Indeed, the Artisan season one boxset is hardly comprehensible to newbies without the pilot, so we're reviewing it here as well. Just another day in the trenches at dOc. One of the running gags in the program is Agent Dale Cooper's fondness for the pie, donuts and coffee in Twin Peaks. Thus, starting at 12 noon, armed with a package of donuts, two pies and my trusty coffee maker, I will fearlessly plunge into the mysterious and often bizarre world of the program, nonstop, from pilot to the end of season one, with its excruciating fourfold cliffhanger. So fasten your seatbelts, because Sparky's taking you on a bumpy ride through the back woods of the Pacific Northwest, where the owls are not what they seem. As is to be expected, the pilot episode is setting up the situations and introducing us to many of the characters in the large ensemble cast. David Lynch's style is evident here, with long, static shots and often excruciatingly slow pacing. When vital information is being imparted, lights begin flashing with static energy, as if some outside force is controlling events and their disclosure. The characters are quirky, and their interplay is beautifully set up. Part of what makes the program still work so well is not that it is a murder mystery, but that it is a world of well-realized characters, who have layer upon layer upon layer of meaning and secrets. The pie, cherry, is offscreen, but is emphasized heavily. Acres of donuts do make it onscreen however. The running time stated on the case is 15 minutes longer than the actual time. Image Transfer Review: The color palette here is intentionally warm, pushed toward gold, red and orange. However, the transfer here overdoes it, without any visible blues. Skin tones have an unnatural, yellowish cast. The picture is slightly soft and has plenty of artifacts and aliasing. Shadow detail is poor, and blacks are rather brownish. There is also some dirt and minor speckling, but the picture is still much better than my VHS copy taped off the air, so I'm certainly happy to have it. Audio Transfer Review: The sound is hissy and rather poor. Worst of all is the fact this disc, although NTSC, is converted from a PAL master. This results in a speedup and rise in pitch that is clearly noticeable to anyone familiar with the series. Bass is heavy and boomy to the point of unpleasantness at time, such as a shot of a fireplace and the jukebox at the local diner. Overly juiced, this is pretty nasty although the basshounds will like it. Extras Review: In addition to trailers for four completely unrelated movies, brief bios and filmographies for Joan Chen and Kyle MacLachlan are provided. Menus are provided in both English and Chinese, for those wanting to practice their oriental languages. A great start to a classic series, though a marginal transfer suffering from PAL speedup. Still, essential for anyone wanting to dive into Season One.